Today’s artist is Silicon Teens, a fictional UK outfit spearheaded by the infamous Daniel Miller, head of independent wave label Mute Records. 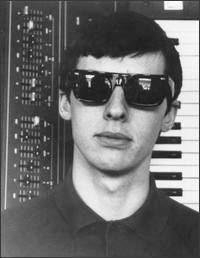 After two releases under The Normal (both the famous ‘Warm Leatherette’ 7” and an experimental live recording with Robert Rental), Miller took to his synths to record a series of updated (and somewhat campy) 50s/60s rock n’roll tunes (alongside two originals), adopting a false ‘teen’ band to handle any budding press. Fad Gadget’s Frank Tovey would act as lead vocalist during interviews as the remainder of the ‘band’ was portrayed by various actors, however, every note and vocal take was recorded by Miller himself. Though one track from the Silicon Teens’ lone release appeared on the soundtrack for Planes, Trains, and Automobiles, the 1980 record had little impact or chart success, and rumour claims that Mute would sign Depeche Mode soon after blowing the lid off the project in attempts to successfully market a true teen wave act. 7. Do You Love Me? This entry was posted on January 7, 2008 at 4:23 pm and is filed under 1980, 1980s, daniel miller, minimal, synth, the normal, uk . You can follow any responses to this entry through the RSS 2.0 feed You can leave a response, or trackback from your own site. fyi…wanna download this and the link isn't working. zshare do not have a long "half life", so you need to reup stuff now and then. Thank you veryyyy much, systemsofromance!